Not long after we purchased our holiday flat in Nice, its football team OGCN were promoted to the first division – total coincidence. They used to play at a small and rather tatty stadium in the north of the city and, for their first few seasons back in Ligue 1, we had season tickets. However, I got fed up of always being surrounded by heavy smokers and my beloved missing 50% of the home games because of business trips. We decided to cancel our season tickets but continued to support them at a number of home matches throughout the season. When the team moved a couple of seasons ago to its swanky new stadium in the Var valley, I had hoped that there might just be a small totally smoke-free corner, but there isn’t. In theory, fans shouldn’t smoke in their seats during the match. In practice they do and why oh why do they always sit in the row just in front of me? I’ve tried complaining to the stewards, to no avail. I generally just have to move seats. Not a problem providing the match isn’t a sell-out. 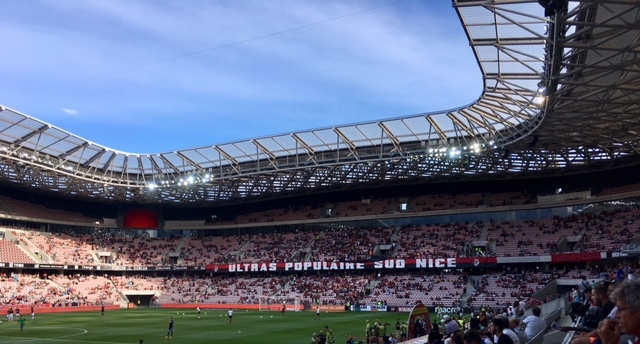 It was OGC Nice’s first home game of the season against Troyes on Friday and I readily agreed to go when my beloved suggested it. There’s nothing I love more than watching live sport with him. On the face of it this should have been an easy win for the boys in black and red who had already beaten the Mighty Ajax to progress to the next round of the Champions League play-offs. They hadn’t lost to Troyes in their last 10 encounters, either home or away. As usual, in the off-season we’d lost a number of players but had managed to hang onto the mercurial Mario Balotelli and had just acquired former-Dutch international, Wesley Sneijder, neither of whom would be playing that evening. We’d also managed to retain our manager, Lucien Favre and, for the time being, Jean-Michael Seri, our very own Iniesta. We were home debuting a number of new players, including the on-loan from Monaco, Allan Saint-Maximim, who was everyone’s man of the match. Sadly, despite having 70% possession and numerous shots millimetres wide of the target, we went down 1-2 from a “smash & grab” raid by Troyes who deployed that old defensive trick “11 men behind the ball” – well their manager is a former goal keeper – and hit us twice on the break. Having already lost away at St Etienne, we’re now languishing in the bottom half of the table. Let’s hope we fare rather better against Naples in Wednesday’s Champion’s League match. Heading away from the match on the bus back to the car parking, the fans were in a sombre mood although this may have been because the heavens had opened towards the end of the match and many were soaking wet! We were out again on Saturday evening albeit to a “free” event put on by the local community. Three times during the summer months (June – Aug), the promenade is closed for a musical extravaganza and firework display. We’d missed the previous two events so decided to head down after dinner on foot. Although free parking is provided at the Hippodrome, we know from past experience that the traffic is so bad it’s actually quicker on foot. Many of the restaurants along the front are allowed to increase the number of tables on their terraces. They typically put on special fixed price menus and generally do a roaring trade on these evenings. There are also plenty of less expensive options with a number of food trucks and loads of picnickers on the beach. Security was reassuringly tight though we were much amused when one of the police horses left his calling card on the closed road. Quick as a flash, his rider leapt out of the saddle, pulled a shovel from his saddle bag and shovelled the dung onto the roots of the nearest tree. I’ve never seen anyone do that before but, given how many kids were enjoying running, riding, scooting or skating up and down the road, it was a sensible precaution. Aside from the six stages featuring different DJs and musical acts there are plenty of activities to wear out the kids such as bouncy castles, huge slides and so on. To be honest we were feeling a little weary from that morning’s ride and, after walking the length of the promenade, fortified by an ice cream, we wandered back home to watch the fireworks from our balcony. 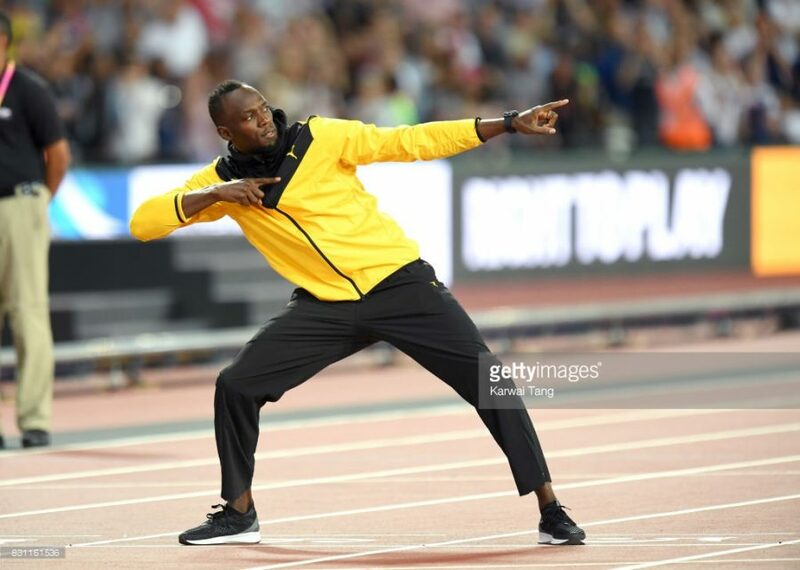 We also wanted to watch Usain Bolt run in the 4 x 100m relay. Sadly limping from the stadium wasn’t a fitting way for him to end his splendid career. But not even the biggest sporting stars are guaranteed a fairy tale ending. At best they just get to choose when and where, not how.